Greek families! Histrionics, rash reaction instead of considered response, inability to control emotion. Tragedy. I don't know much about this play: what was Racine's source? It feels very Classical Greek and very Ted Hughes and not really French at all in this version. The language is not as extreme, stylistically, as in Hughes' version of Seneca's Oedipus put the trademark bluntness, abruptness and anachronisms are all present and correct. 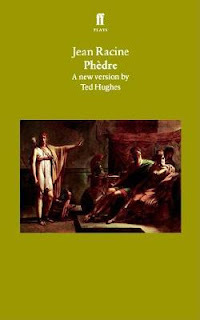 If Hughes achieved anything with his translations of Classics and material with Classical sources, it was making gripping reading of them. He really did rescue these plays from lecture theatres and put them in real theatres. I like this less than Hughes' other Greek-based works but I think it's to do with the source material - it's not as nutty as Oedipus or as philosophically interesting as The Oresteia - but that's not to say I disliked it at all: it got devoured in two short sessions.